Creativity is a beautiful thing especially when the result is spectacular! 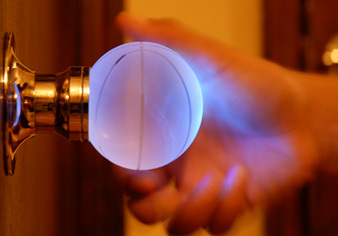 Krystal Touch of New York introduces the Wave Crystal Door Knob Set. 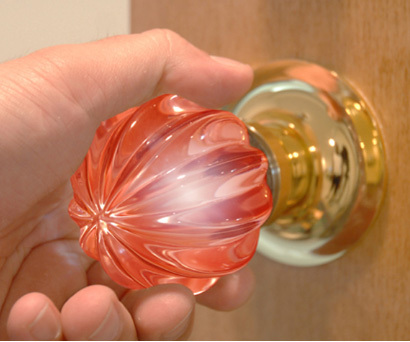 A superior quality crystal makes this fantastic doorknob set, which illuminates with the touch, stays illuminated for one minute and then goes off, until touched again. 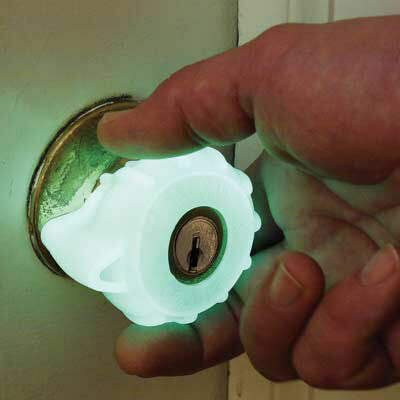 If in your home there is a dark corridor, or a dark closet, this doorknob will keep you in the light. LED light illuminates one side or both sides of the knob and fits standard doors thickness of 1-3/8″ to 1-3/4″. Guarantee for a life, the price is very affordable, these knobs make great solutions for a home with character. Emtek combines functionality, design, and fun all in one with its collection of Brighthandle, made of acrylic levers and stainless steel. Perfect for public restrooms and hotels, when the room is occupied the levers illuminates with LED lighting powered by a single AA battery. No need to put the Do Not Disturb sign against the door anymore. These levers are more expansive than the illuminated doorknobs, about $250 per door set. It is fairly a new product and like all the new products, the price will come down with a larger market demand. I placed the answer inside of the blog for everyone to see. Thank you for your interest and for stopping by. 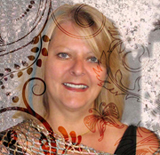 Thank you Sindy, they make an unpretentious door come alive.